Well, maybe not everyone. 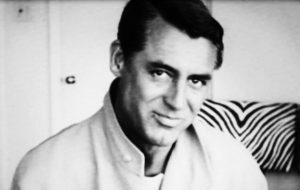 Possibly not viewers of Becoming Cary Grant, a mostly cheerless yet spellbinding documentary about the demons haunting Hollywood’s most famous leading man. The filmmakers use Grant’s own home movies, a melancholy musical score, and excerpts from the actor’s unpublished autobiography to tell the story of a 9-year-old Bristol boy who lost his mother (she was committed to an asylum), then as an adult went through a series of failed marriages, and who gradually invented the persona of “Cary Grant,” the enigmatic, charismatic star we all know from the movies.